TownleyGirl has been coming up with some of the cutest and most innovative girls and boys cosmetic products out there!. This Easter make sure to stop by TownleyGirl and check out their wide selection of products for kids. They just introduced a new line that my daughter loves. 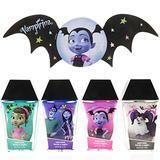 Their Vampirina line includes 5 amazing Vampirina themed products. They have some of the newest and most loved characters out there Play Doh Bath, Coco, My Little Pony and so much more. The Play Doh bath is perfect for boys and girls! We tried the Vampirina 12 Piece Press On Nail Set; Sierra loved it! Press and impress! These press-on nails, inspired by her favorite vampire, are sure to get those nails looking trendy in no time. These are perfect for little girls. They remove very easily! 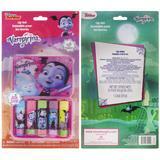 The TownleyGirl Vampirina 5 Pack Lip Balm With Bonus Tin is great for boys or girls. Everyone needs to keep their lips healthy! If your little one loves Vampirina, then this is the right gift for her. Five moisturizing lip balms and a bonus tin featuring the new star of Disney Junior, she'll carry this gift with her wherever she goes! The set includes an assortment of five moisturizing shimmery lip balms and glitter bonus tin in colors and flavors include: blue cotton candy, rose strawberry, green watermelon, purple grape and yellow bubble gum. Vampirina Glam On The Go With Keychain features a keychain with 2 interchangeable lip glosses and one balm. Take along just one or all three it is your choice! What a treat! These Vampirina lip glosses and balm are deliciously scented, and the key chain included is perfect for clipping onto a backpack. Sheer Lip balm, shimmery lip glosses and collectible key chain. With lip balm and gloss colors and flavors include rose strawberry, purple grape and green watermelon! 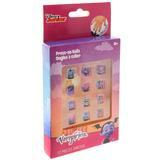 Vampirina Super Sparkly 4 Pack Nail Polish Set With Nail File is the sparkliest! It is sure to make heads roll! 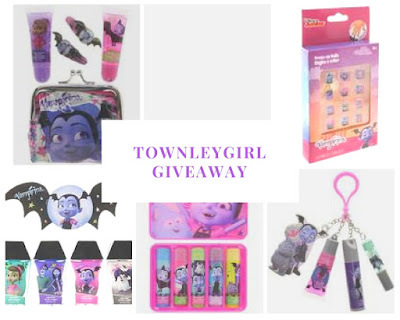 It includes four vibrant shades of polish in coffin-shaped bottles, plus a BAT-TASTIC nail file and all of it features your favorite Vampirina characters! Set includes an assortment of 4 nail polishes and nail file. Nail polishes are non-toxic, peelable, water-based and bubble gum scented; shades include teal, purple, peach shimmer and white glitter. Girls will love this set! The Vampirina 2 Pack Lip Tube With Purse and Clips is one of the best carry on kids clutches I have seen. I love TownleyGirl's coin purses for kids they have so many purposes my daughter carries hers everywhere. The clips are great to keep her bangs out of her eyes. Your little one will adore this lip gloss set. It includes 2 lip tubes featuring her favorite batty girl, and even a matching purse. Exact contents included are 2 shimmery lip gloss tubes, 2 clips and 1 purse. The Lip gloss colors and flavors include rose strawberry and dark purple grape. What a fun giveaway for those with little ones! The Frozen Dress-Up Beauty Set is something my granddaughters would like. It’s reasonably priced also! I wont this giveaway and it has been 6 weeks. I have written you several e-mails and you haven't replied to me. I never received my package. Could you please answer me as to when I can expect it.